2. Condensates or tar are seeping through the chimney walls causing staining, either inside or outside the building. 3. The flue is much too large. 4. The flue is too cold and is not drawing properly. 5. Incorrectly fitted liners from the original construction. 6. Resistance to the flow of gases caused by an eroded flue surface. If, however you intend to bring your existing flue back into use it must be swept and smoke tested by a competent person to deem it sound. Nowadays, there is a wide choice of factory made chimney and flue products available. To find out which one is best suited for you please visit our showroom to discuss your requirements. Alternatively arrange for one of our engineers to carry out a free home survey. Flexible flue liners can only be installed inside a masonry chimney. Combustible enclosures such as timber or plasterboard are not acceptable. They are manufactured from corrosion resistant stainless steel and are a twin skin construction. They are intended for gas, oil, and multi-fuel where flue gas temperatures do not exceed 600 degrees C. There are generally two grades of stainless steel liners available. The most commonly used grade is 316/316. We would recommend installing a 904/904 grade liner if you intend to use coal based solid fuels. To offer peace of mind the liners we install are amongst the best quality on the market. They are issued with a guarantee period to match that of the new appliance (or 20 years for 316/316 grade liners and 35 years for 904/904 grade liners, whichever is greater). The same can’t be said with many of the cheaper alternatives. For a flue to work effectively, it must be kept warm to increase the upward speed of flue gases and to help prevent condensation forming. We would always advise where feasible to insulate your new liner. Particularly if the chimney is in an exposed location, the stack is particularly tall and / or if the existing flue has a large surface area. There are many methods commonly used to insulate flexible flues including vermiculite, leca beans or rigid Rockwool sections. However our preferred choice is Chimwrap, a unique and patented product manufactured in the UK designed with ease of installation in mind. It is available in 1, 2 or 3 metre sections with a thickness of just 12mm making it ideal for installing into even the tightest of situations. 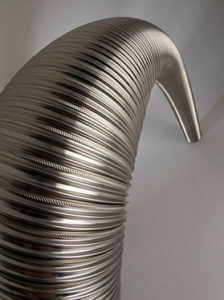 Rigid flue components are fabricated with a stainless steel inner liner and outer casing. In addition a high thermal performance mineral fibre sits between the two walls. As a result these flues can be positioned as little as 50mm from combustible materials. The systems are designed for internal or external use and are generally used when there is not an existing chimney present. They are ideal for both new build and renovation projects as they offer a quick, low cost way of installing a new stove just about anywhere in your home. Pumice is a natural volcanic material found in Iceland. It offers excellent insulating properties and high resistance to expansion and contraction with temperature change. Although extremely robust in construction it is also lightweight in design. As a result each chimney system is quick and easy to install. Pumice flue systems are extremely versatile and can be used both internally or externally. In addition they can be used for both the construction of new and the refurbishment of existing chimneys.